You are looking at my 1977 Jeep CJ-5 that I bought in the spring as a small project to drive for the summer.It was last on the road in 2005. 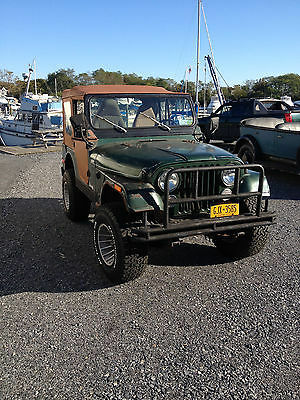 Jeep has a 258 straight six, 3 speed transmission, Dana 20 transfer case, model 20 rear with 1 piece axles, Dana 30 front, Manual steering and manual drum brakes.True mileage is unknown. 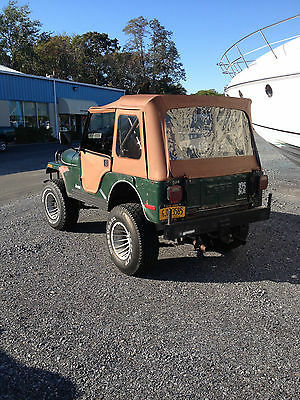 Has a Bestop soft top with 2 piece doors and newer Bestop front buckets, no rear seat. I have over $2000 worth of receipts for parts that I have put into the Jeep and will do my best to describe it. The engine has a new Comp cam, timing set, lifters, pushrods and rockers. Head was sent to the machine shop for a rebuild that included a 3 angle valve job, new guides, seals, springs and locks. Motor was reassembled with Fel Pro gaskets, new water pump,full tune up including cap, rotor and wires, heater core and hoses. 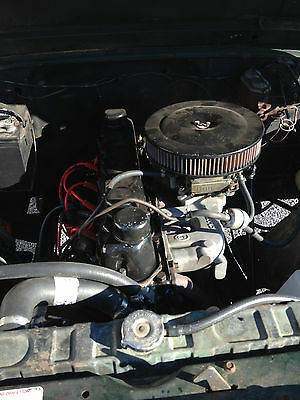 Has a Clifford aluminum intake, Holley 4 barrel carb, K&N filter, split header with dual exhaust and Mallory ignition. Runs good, clutch grabs good, doesn't overheat, good oil pressure, slight occasional stumble on acceleration, just needs some more tuning. Brakes were gone through, shoes and hardware were like new, all 4 wheel cylinders were replaced along with both front brake hoses and both rear emergency brake cables. Steering shaft from column to box was replaced with a HD unit. Transfer case linkage was rebuilt to remove all slop and shifts great. Has vintage 4WD hardware front hubs that look like copies of a Selectro hub. Jeep is rolling on real Western aluminum wheels, 15X10 with 32" tires, fronts are brand new B F Goodrich All Terrains, rears are like new Widetrack Radial Baja. 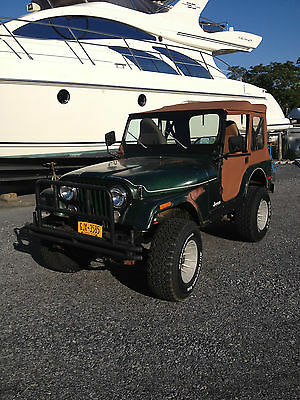 Jeep has a small lift of unknown brand and custom home made front and rear bumpers. I welded in some patches to the front floors and tub sides under the Jeep logo then covered the repairs with aluminum diamond plate on the outside. The tub does have some other rust, worst being at the rear crossmember. All other body mount areas are solid. Frame has no rot at all, jus a little surface rust as to be expected with a 1977 vehicle. The only other negatives that I can think of is there is no speedo cable, slight oil drip from drain plug and the gas gauge doesn't work. Miscelaneous new stuff includes new wipers and arms, headlights, marker light lens and bulbs. Windshield is good, all lights and heat work, currently registered, inspected and driven. Comes with a box of spare parts, full set of used fender flares, extra tire not on a rim and a replacement tailgate. While the Jeep does run and drive good I have only driven it locally and wouldn't suggest flying in and trying to drive it across country unless you're into that sort of adventure. I welcome anyone nearby to come and look at it in person. Also for sale locally.